Green screeds are usually 1:3 or 1:4 cement and sand at a usual thickness of 50mm. These screeds can be applied both bonded directly onto a concrete base or un-bonded (applied on to a polythene sheet damp proof membrane). Both screed and concrete are referred to as being green during the period from application through to the time it gains strength and reaches dimensional stability. Newly-laid cementitious screeds and concrete contain relatively large amounts of water, which need to be retained while the cement binder is gaining strength. Full strength may not be achieved for a period of 28 days but screeds should be kept moist for at least 7 days to allow sufficient strength gain before drying is allowed. After this period, retained water needs to evaporate away until a normal moisture content is reached. During this time shrinkage occurs to compensate for the volume loss of water. Tiling a screed too soon whilst the substrate is still stabilising can result in tiles blowing away from their base (heaving) as the screed shrinks below. 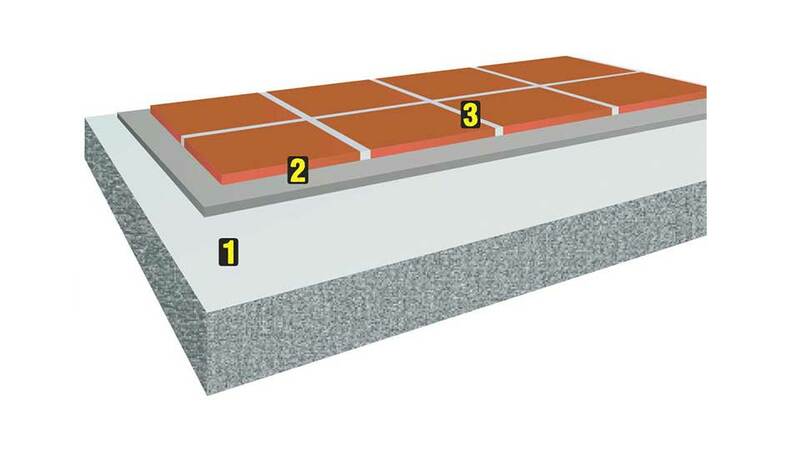 Concrete substrates take far longer to reach stable equilibrium than sand and cement screeds due to their greater thickness. Cement-based materials need to retain moisture until the hydration process is complete. To this end a polythene sheet is often laid over newly applied screed for seven days to control evaporation of water and ensure that full strength is attained. In warm and well-ventilated drying conditions, screed up to 40mm in thickness can take 1 day per mm to dry. Thicker substrates will require 2 days per mm. BS 5385-3:2007 Code of practice for the design and installation of ceramic floor tiles and mosaics, specifies that a screed shall be left for at least 3 weeks to dry prior to tiling. However, other documents specify longer periods and BS 8204 recommends 1 day per mm, for thicknesses up to 50 mm. Normally 3 weeks is the absolute minimum. Flexible adhesives and grouts, which tolerate movement, compensate for the shrinkage in the substrate and yet still allow the screed to evaporate excess water through the grout joints. They are ideal for fixing ceramic and porcelain tiles as well as calibrated stone and slate. Screeds should be firm enough to walk on, usually at least 3 days after application, before tiling can be started. Concrete should be at least 7 days old. All substrates to be tiled must be clean and surface dry. Particular care should be taken that movement joints are adequately specified. Fix the tiles into a solid bed of weberset pro lite - rapid at 5 mm thick. Leave joints at least 3mm wide for grouting and make provision for movement. Grout the joints with weberjoint wide flex and use weberjoint silicone to fill perimeter movement joints.